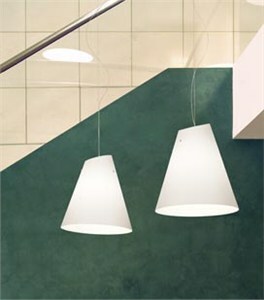 DESCRIPTION Pendant fixture providing direct downward and diffused ambient light through its hand-blown conical glass diffuser available in two sizes: MICENE pendant S25 and MICENE pendant S38. Companion table, floor and wall fixtures available. CONSTRUCTION Hand blown Murano glass diffuser is connected to a nickel plated metal canopy by a 10 foot steel cable and clear cord; custom length is available upon request. LIGHT SOURCE 1 x 100 watts, incandescent, A-19, clear (provided). 1 x 100 watts, quartz halogen, E26 base (not provided). FINISHES Mounting plate and glass holders: brushed nickel. GLASS COLOR Satin White, Satin Amber.